Researchers from ETH Zurich and the University of Bern are studying lakes in Switzerland to learn about tsunamis and their hazard, what triggers them, and how often they have occurred in the past. It has been more than 400 years since a tsunami flooded the banks of Lake Lucerne and the city of Lucerne. The tidal wave was caused by a 5.9-magnitude earthquake, which triggered several underwater landslides as well as a rockslide on the Bürgenstock. These events subsequently caused a shock wave that spread across the entire lake. Based on historical records, it was estimated that the wave was four metres high: near Ennetbürgen, reports describe flooding "1,000 paces or three rifle shots" into the hinterland. Today, the lowlands and shores around Ennetbürgen are fully civilized: the shore is dotted with buildings, a marina, a camp site and a water sports centre, while intensively used meadowland stretches far into the hinterland. The risk of tsunamis on Lake Lucerne and other Swiss lakes has not disappeared, however, and the one in 1601 was not a one-off event. They happen rarely, but the possibility cannot be fully ruled out. This is why researchers from ETH Zurich, the University of Bern and the Center for Marine Environmental Sciences in Bremen began a major research project to learn about the hazards posed by lake tsunamis, how often they have occurred in the past, what triggers them and what effects they have. 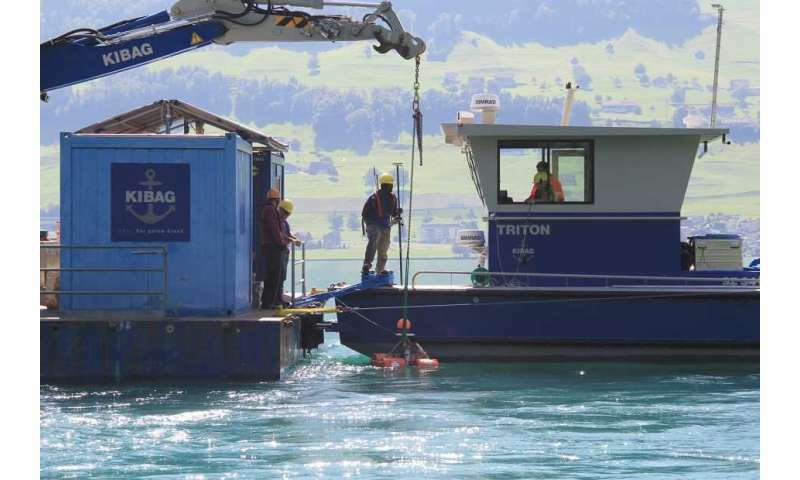 The project focuses on taking seismic measurements in Lake Lucerne. The researchers place special underwater seismometers in various locations to obtain seismic and geotechnical measurements on the lake floor. The researchers are also studying landslides in river deltas. In 1687, for example, sections of the Muotha delta slid, causing a tidal wave on Lake Lucerne. By examining cores drilled on the shoreline and in the lake bed, researchers are searching for deposits caused by tsunamis. They are also using computer models to simulate how tidal waves might spread across the lake. ETH professor Donat Fäh is in charge of the main part of the project. Fäh is Head of the Earthquake Hazard & Risk Assessment Section for the Swiss Seismological Service. He plans to closely examine the internal structure, volume and properties of lake sediments. The researchers also want to learn what processes unfold in the sediments and how stable they are. They hope to develop a geophysical and geotechnical 3-D model to study the propagation of seismic waves or deformations caused by earthquakes, for example. Finally, they also want to develop computer simulations for earthquake scenarios. Another goal for Fäh and his colleagues is to improve the quality of observational data, specifically by upgrading the existing seismic monitoring stations and creating new ones. There are plans to install 70 new stations by 2020. The observational data should allow researchers to better analyse seismic hazards. This project is part of a larger Swiss research program, which aims to understand how the local subsoil affects the earthquake hazard and phenomena caused by earthquakes, such as soil liquefaction or landslides. "This project is a classic study of natural hazards for Switzerland," says Flavio Anselmetti, who is a geology professor at the University of Bern and is in charge of the tsunami project together with Donat Fäh. He adds that lakes also offer a perfect model for understanding oceans, and the knowledge they hope to gain from this project is likely to be applied to ocean phenomena as well. The tsunami project has been underway for a year now, with three more projects planned as well. To help cover the total cost of CHF 2 million, the Swiss National Science Foundation is funding it as an interdisciplinary, multi-university Sinergia project. ETH Zurich and the Federal Office for the Environment are also providing funding. Researching tsunamis in Swiss lakes might seem a little absurd or exotic to the general public. What are the reasons behind this project? Donat Fäh: Tsunamis in lakes might be rare events, but they do have the potential to cause great damage. The history of tsunamis in Swiss lakes proves this. Just like any other natural hazard, they therefore need to be studied and quantified to allow us to define preparatory measures. How likely is it that a tsunami will occur in a Swiss lake in the next 100 years? Our current knowledge in this regard is still incomplete and we will be working on this in a subproject of the SNF Sinergia project for Lake Lucerne. What is important is not only how often tsunamis occur, but also the height of the waves and their geographical distribution along the shoreline. Which Swiss lakes are most at risk? To answer this, we would need complete data on the volumes and internal structure of the sediment deposits of every lake in Switzerland. This information is still only partially available. The "Response" part of the project will address this issue for Lake Lucerne, so that the maximum magnitude of tsunamis and their effects can be estimated as well. What are you and the Swiss Seismological Service most interested in finding out? One of the Swiss Seismological Service's research focuses is earthquake-induced phenomena. In addition to tsunamis, these include earthquake-induced mass movements such as rock falls, landslides, soil liquefaction and large-scale subsidence. A comprehensive earthquake risk analysis not only considers the direct effects of seismic waves on buildings and infrastructure, but also the impact of induced phenomena. In the Alps, these can reach huge proportions. Who will benefit from the results? With the lake tsunami project, we are laying the foundations for earthquake preparedness, which ultimately benefits the public as a whole.